Passion X is duty boat next Wednesday at RANSA and so assured a fourth place for the day. That will not be enough to change our overall series position as the fleet is small and a last place can be a third on a bad day. Today’s race was cancelled for fear of a few gusts over 30 knots that were noticed before the scheduled start. 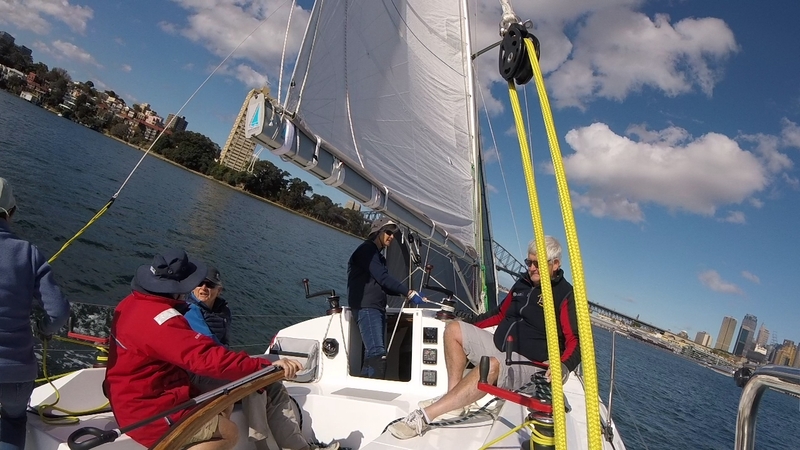 We moored up in Rushcutters Bay solving the worlds problems and for the afternoon our maximum recorded wind speed was 30.4 knots which was significantly less than last week. Now I would be the last person to criticize a race committee for cancelling a race due to strong winds. They have an implied duty of care to the competitors and any decision has to be respected. 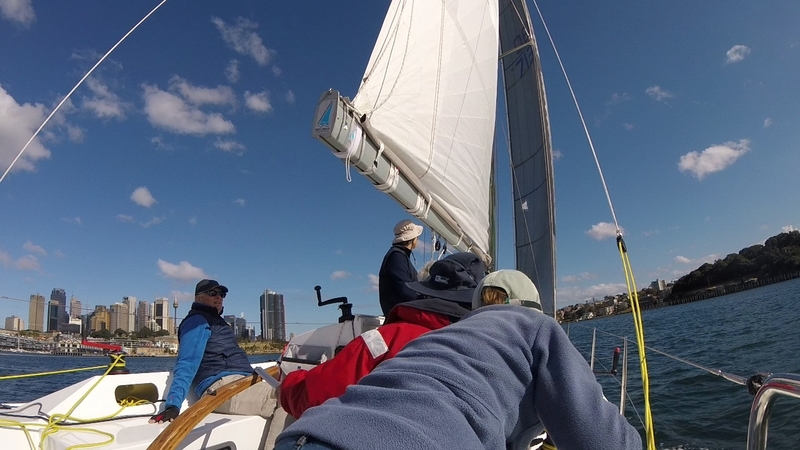 That said we would have enjoyed the race today as the wind was strong enough for our No 4 jib and a reefed main and the wind angle was a broad reach up and a tight reach home. The crew has waited patiently for these conditions all season and to be denied the race on the last day we were were sailing was frustrating indeed. 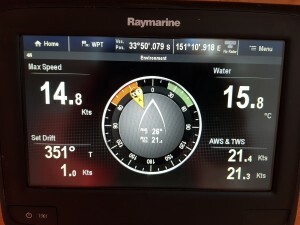 With the wind strength and angle we have consistently been with Blue Chip at the Cannai Point mark and the angle home was the broadest it has been all season so we feel we would have kept Marloo and Sorcerer at bay at least until the work home from Shark Island. The conditions gave us the best chance we have had all season for a first place but it was not to be. The only first place we had all season was the third race when the conditions were quite light but no so light as to have the race abandoned. The next light race that we finished was a weird wind pattern when Sorcerer and us were left in a hole and finished long after the fleet. For the season we were not last fastest in every race. We did beat Blue Chip once when they got lost and we did beat Marloo and Sorcerer once when they decided to sail a longer course. 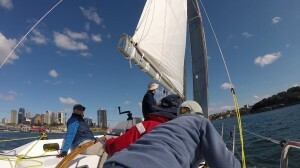 In actual sailing we did beat Sorcerer twice in light conditions. In fair sailing we were not last only twice in the season and that was with a trouble free series when we had no breakages or brain fades. We would prefer if more yachts of Passion X’s speed were included in the Division 1s. Amante, Allegro and Fidelis have all had a turn and did not like it. Well we liked the longer course but found the lack of close competition very frustrating. 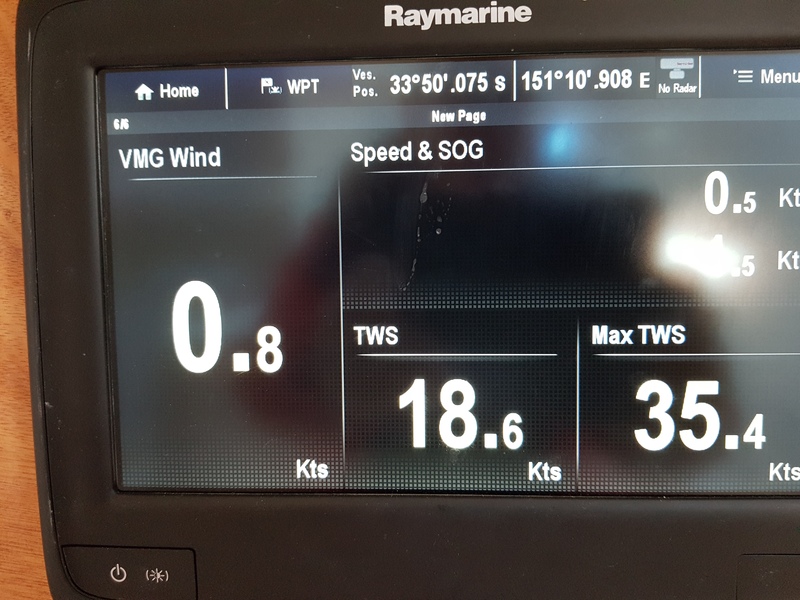 There is a wind strength range from 8 to 18 knots where we do not have the righting moment to keep up with the more powerful beasts. Over 20 knots we have a small jib and can sail survival mode quite well as well as doing well downwind. Under 8 knots our tenderness is not a handicap. Perhaps I need a bigger boat! The new No 4 jib is getting quite a work out and I am already happy to hoist it if the breeze is forecast to be above 18 knots. 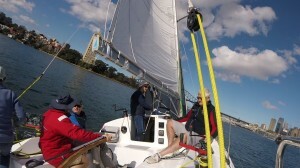 Today the forecast was for 23 knots so we started the long reach to Cannai Point with the No 4 jib and a full main. Ignoring the larger quick boats, Ichi Ban, Margaret Rintoul V and Duende, our usual competition, Blue Chip, Marloo and Sorcerer, set larger genoas and reefed mains. While the wind was strong we did well keeping ahead of these last three but when it lightened we were caught by Blue Chip. At one stage we hit 14.8 knots boat speed in a 35.4 knot wind gust which was some quite exciting sailing. At quite long periods the breeze dropped back to the 13 knot range where we were a bit too comfortable. There was even one point when Duende and Margaret Rintoul V were becalmed and we caught right up to be alongside their position. Simultaneously Sorcerer and Marloo caught up to us as we lost the ground gained during the 30 knot wind stage. We rounded Cannai Point hard on the tail of Blue Chip and for a while in the very strong wind we held our own. Sorcerer behind had trouble in a big gust and lost a lot of time in a round up. 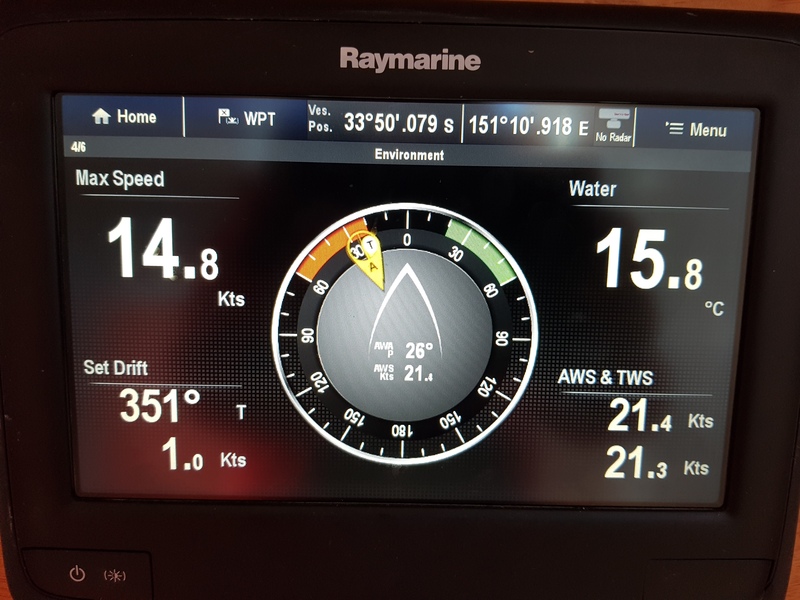 While we had the sheets cracked off to get down to the channel mark we held our own but as the wind headed Marloo came steaming through and Blue Chip built up a handy lead. We chased these two through Rose Bay and due to course uncertainty rounded the Point Piper mark on the way back to the finish line. It was not out of our way and Marloo had rounded it and headed off to round the island. Sorcerer which had now caught up to our tail also ran away as if to round the island. We were still beating to the finish when Marloo and Sorcerer changed direction and followed us home. They both made up a lot of ground on the hard beat home but the course was too short for them to catch the time they had lost in their respective detours. I believe that with our handicap we would have beaten Sorcerer and Marloo on the day but judging by the finish times I think they threw away places to Duende and Blue Chip with their detours. We were very happy with our second on handicap but more so pleased that the time differences were shorter than usual for windy conditions taking into account the short course. The angle of breeze suited us with a lot of the early beat back free enough to crack sheets and the stronger wind on the downwind leg also suited our light hull weight. After the disappointment of Wednesday in not getting the Gopro camera to work I spent time on Thursday connecting and disconnecting the network settings and learning how to not interfere with the phone blue tooth connection to the car multimedia. That solved I decided to try the camera in shutter button only mode on Friday and that worked well. Friday’s conditions were benign and we set the black No 1 Genoa from Passion. It is just under 40 % LP and will do until it wears out and we get a slightly larger one that clears the shrouds. In the meantime we get a small deflection in the foot of the genoa when strapped on tight. The small fleet and pursuit start means a very relaxed sail and with our share of luck we passed the fleet before Long Nose and stayed in front for the rest of the race. We seemed to have a private breeze along the Hunters Hill shore where we passed most of the fleet. We passed within a few metres so it was a most unusual breeze for which we claimed we paid for “premium” breeze. When the breeze filled in across the course Pistol Dawn made a good impression of being a serious threat at stages but in the end our longer waterline and generous sail area won the day. After the race I switched off the instruments so that the wifi would not interfere with the go pro and paired the mobile phone for a quick review of the footage. It was all there in 17 minute blocks and post race it has given Elaine and I a lot of amusement revisiting the race. On review we were a very professional crew who managed the yacht with little fuss. Elaine is looking forward to some footage from some wild days when the conversation might not be so civilised but for now the record is clear.